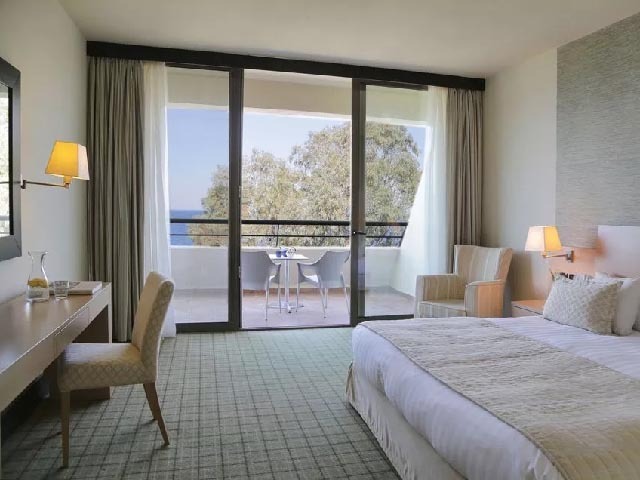 Located on the sandy beach of Chalkidiki, Porto Carras Sithonia offers 5-star accommodation surrounded by landscaped gardens. 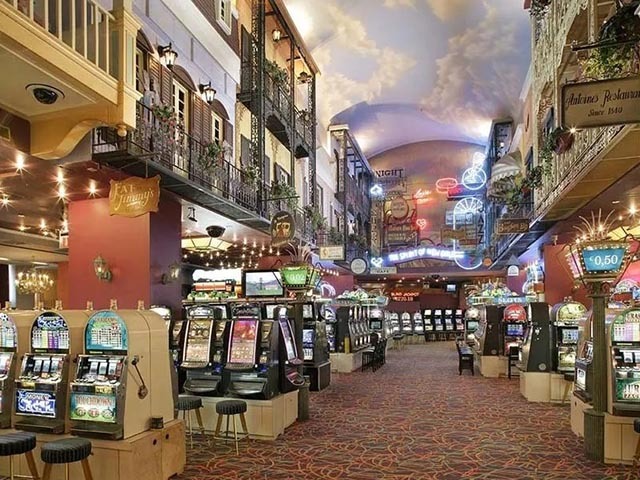 It features a private marina, a casino and a spa centre. 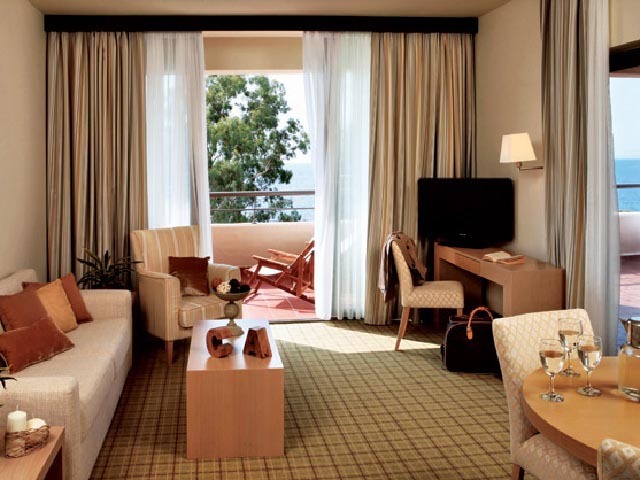 Porto Carras Sithonia rooms are luxuriously decorated with elegant furnishings and marbled bathrooms. 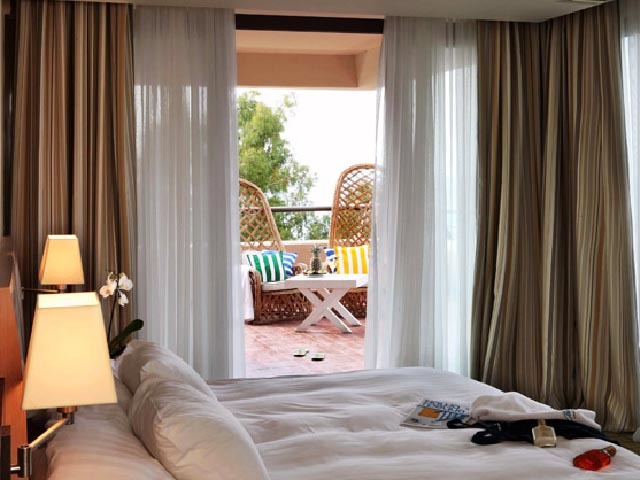 Their balconies boast views of Toroneos Bay or the complex’s golf course. They are all equipped with satellite TV, air conditioning and hairdryer. The hotel’s state-of-the-art spa offers exclusive thalassotherapy treatments and includes a hamam, sauna, indoor pool, hair salon and fitness room. 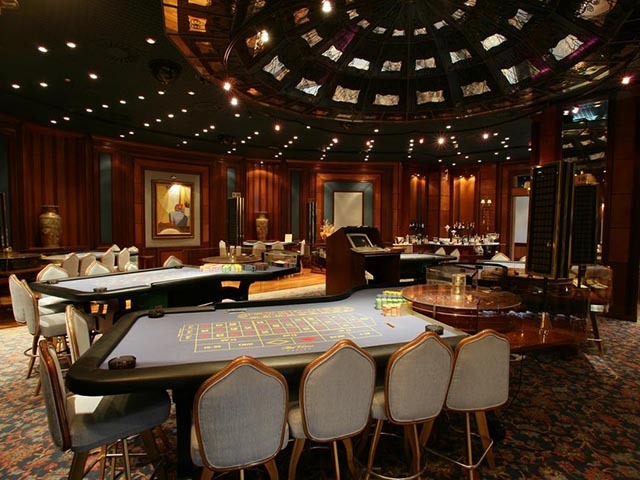 Other leisure facilities include a football field and basketball court, as well as an 18-hole golf course. 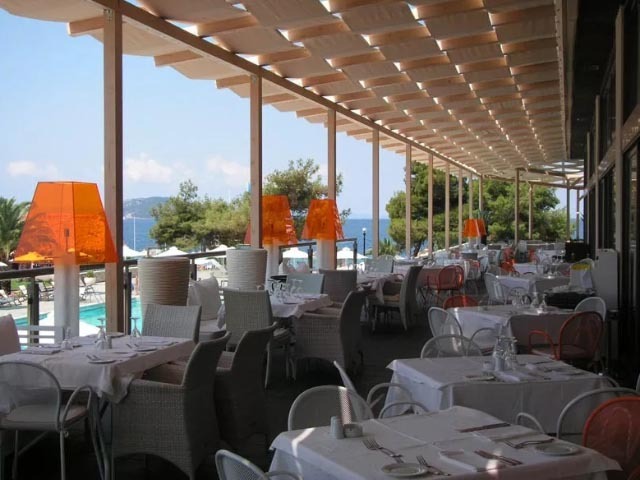 Porto Carras Sithonia features 3 restaurants serving Mediterranean and ethnic cuisine. 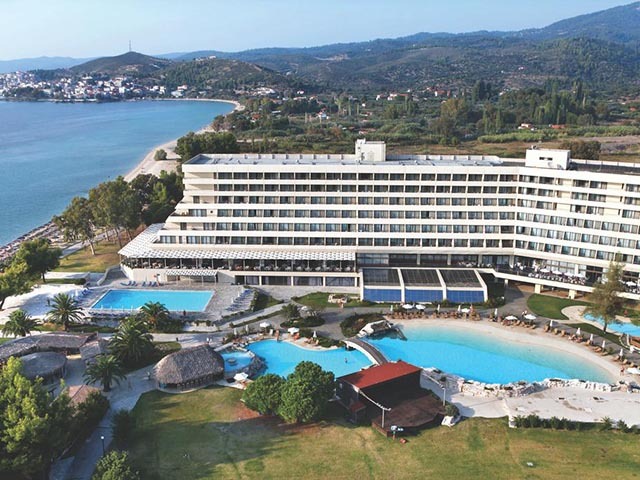 5 bars, at the pool, the beach, the lagoons and the casino of Sithonia, serve refreshing cocktails and wine from the hotel’s own vineyards. Special children’s activities are organised by an animation team, while there is also an on-site riding school offering horse riding lessons.Neos Marmaras is just 1.5 km away. Free private on-site parking is possible and free Internet access is available in some public areas. 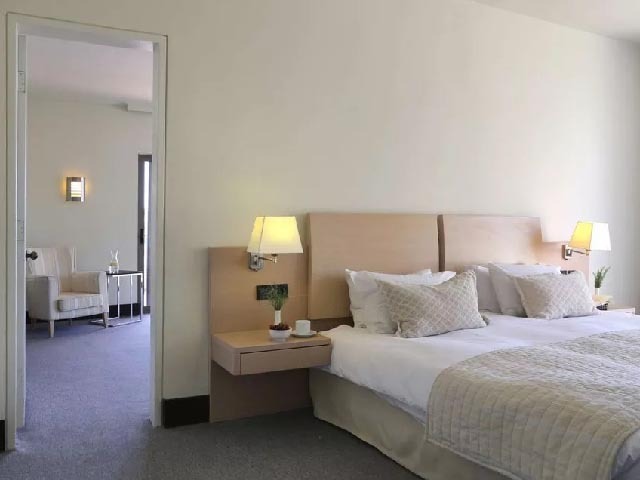 Spacious guestrooms(18-26 sqm), complemented by an elegant sitting corner with a sofa or extra bed, en suite marble bathroom and superb golf views. It can accommodate up to 3 guests, a maximum of 2 adults and one child (in sofa bed or extra bed). 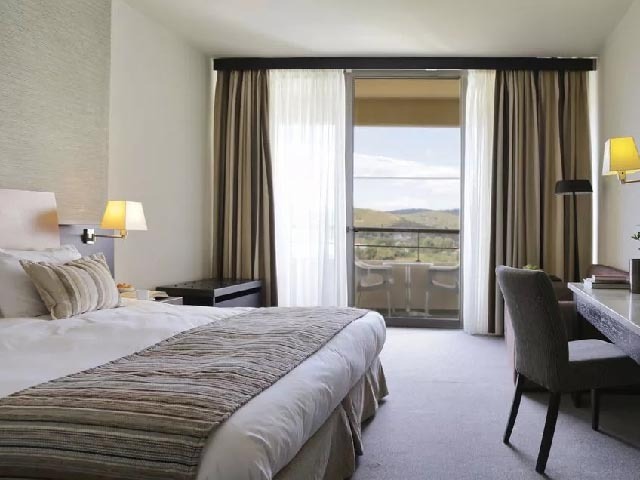 Beautifully appointed suite (29-31 sqm), complemented by a sitting corner adding even more comfort, en suite marble bathroom with bathtub and a private balcony with furniture and stunning golf views. It can accommodate up to 4 guests, a maximum of 3 adults and 1 child or 2 adults and 2 children (in sofa bed or extra bed). Graciously appointed one-bedroom suites (63-104 sqm), with en suite marble bathroom with bathtub, a spacious sitting area complemented by a dining corner and a separate WC (in some suites). It features a private terrace with furniture and magnificent golf views. It can accommodate up to 4 guests, a maximum of 3 adults and one child or 2 adults and 2 children (in sofa bed). 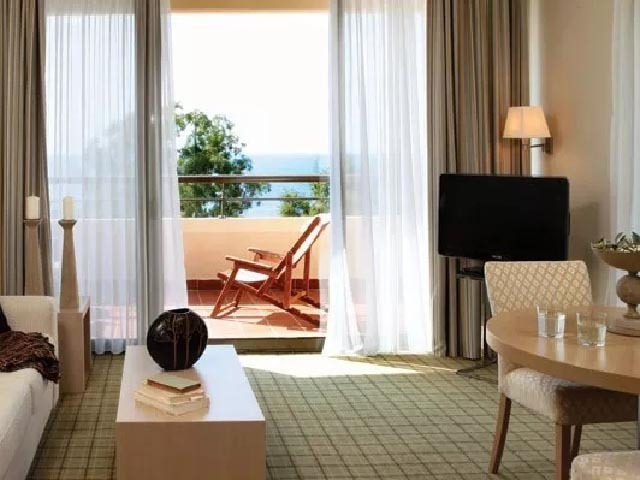 Beautifully appointed suite (34-38 sqm), complemented by a sitting corner adding even more comfort, en suite marble bathroom with bathtub and a private balcony with furniture and stunning golf views. It can accommodate up to 4 guests, a maximum of 3 adults and one child or 2 adults and 2 children (in sofa bed or extra bed). 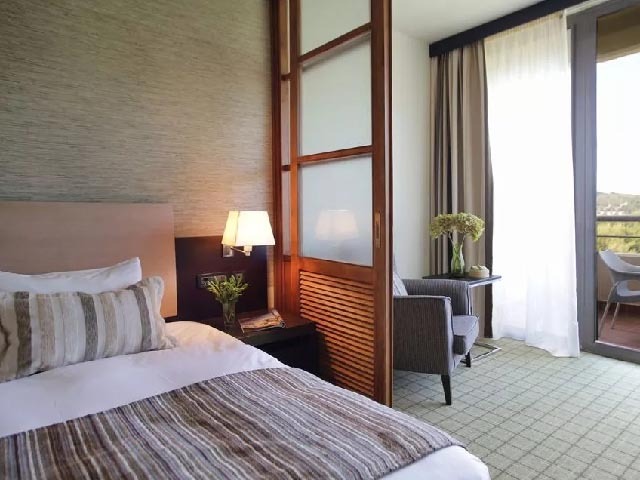 Wonderfully appointed two-bedroom suite (90-100 sqm), with its own en suite marble bathroom, conveniently combining a Deluxe Suite with a Superior Double Guestroom via an interconnecting door to comfortably accommodate up to 6 guests, a maximum of 4 adults and 2 children (in sofa bed). It features an elegant sitting area with separate WC and two private terraces with magnificent sea views. 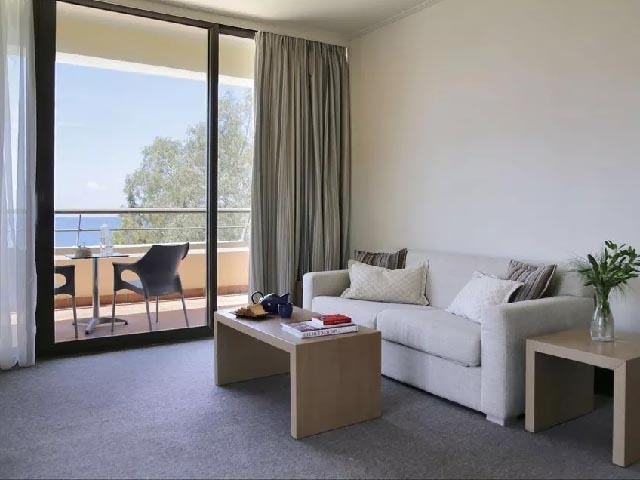 Magnificent two-bedroom suite (126 sqm) with its own en suite marble bathroom, an elegant living room with dining area and kitchenette, and a private terrace with superb sea views. It can accommodate up to 6 guests, a maximum of 5 adults or 4 adults and 2 children (in sofa bed or extra bed). Graciously appointed three-bedroom suite (130-170 sqm), with its own en suite marble bathroom, conveniently combining an Executive Suite with two Superior Double Guestrooms via an interconnecting door to comfortably accommodate up to 9 guests, a maximum of 6 adults and 3 children (in sofa bed or extra beds). It features a sumptuous living room with separate WC, an extra sitting area, a large private terrace and two more balconies with furniture and magnificent side sea views. 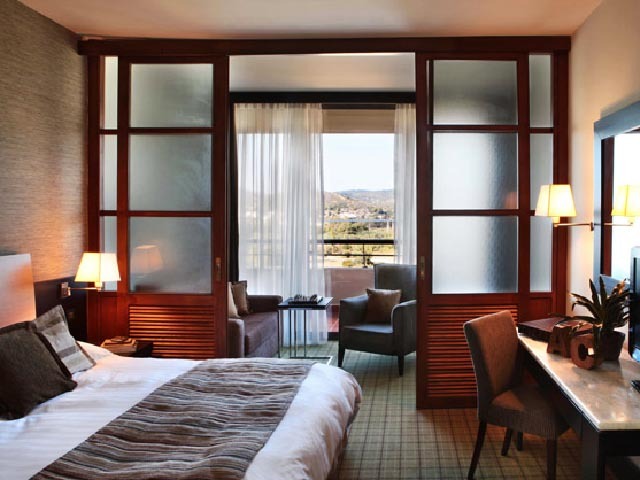 Wonderfully appointed 4-bedroom suite (140 sqm), with its own en suite marble bathroom, conveniently combining a Family Suite with two Superior Double Guestrooms via an interconnecting door to comfortably accommodate up to 12 guests, a maximum of 8 adults and 4 children (in sofa bed or extra beds). It features a sumptuous living room with dining corner and a separate WC, a large private terrace and 3 more balconies with furniture and magnificent sea-side views. 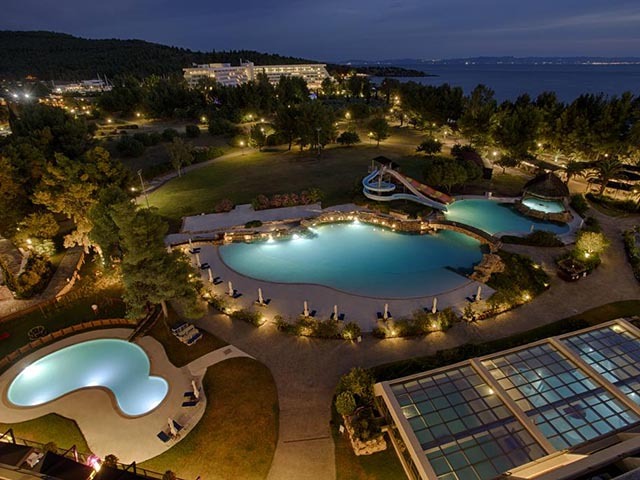 The Porto Carras Sithonia Thalasso & Spa is located 1,5 km from Neos Marmaras in Halkidiki which is the nearest cosmopolitan Village, directly on a 1600 meters, Sandy Beach, surrounded by beautiful Gardens and 34 Hotel owned picturesque natural Private Beaches, coves and cheeks. 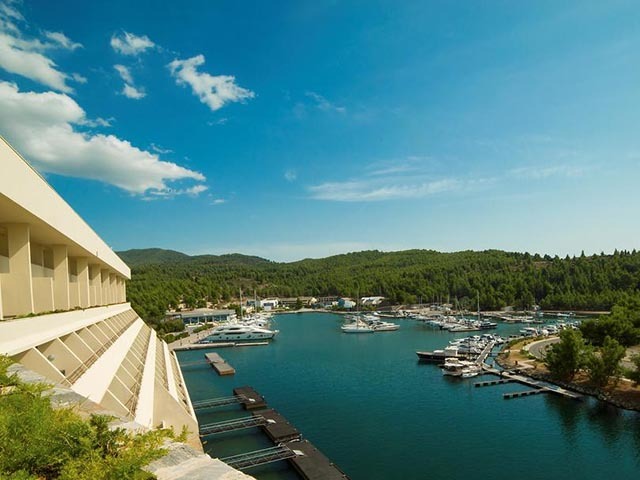 A Complete Luxury Resort, a masterpiece of architectural design and landscaping has transformed four thousand five hundred acres of wild countryside into one of the most beautiful and fascinating places on the entire Mediterranean. 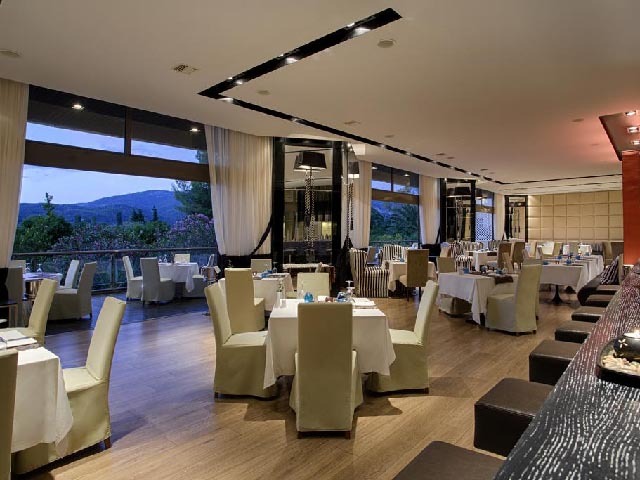 This amazing Resort is to be found on Sithonia the central prong of the Halkidiki Peninsula in Macedonia. Sithonia, with its lush greenery, thrusts out into the blue waters of the Northern Aegean sea, attracting even the most critical tourist to this land of wonderful scenery and unusual beauty. 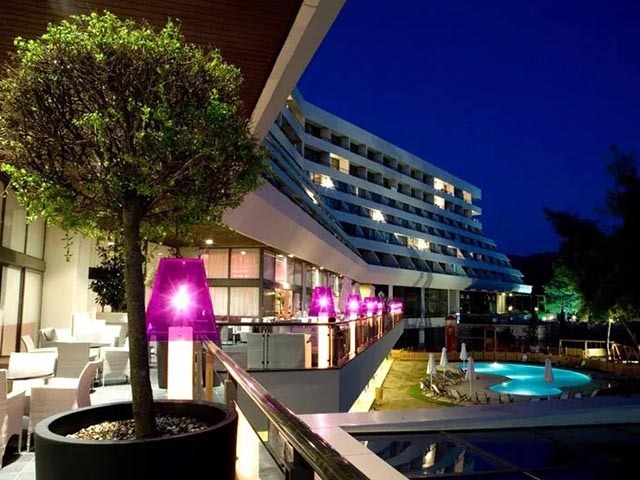 The Porto Carras Sithonia Thalasso & Spa stretches along 10 km of unspoiled coastline. There are more than thirty secluded sandy coves, each lapped by crystal clear waters and each offering a peaceful sanctuary for quiet enjoyment. 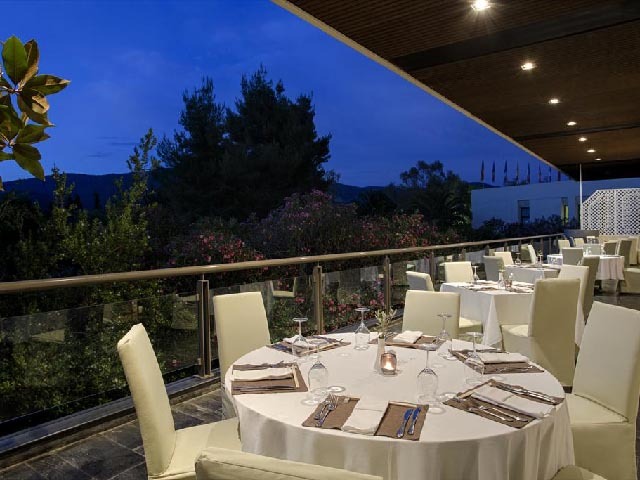 Rolling hills, made green with over a million vines, a forest of olive and almond trees and colorful citrus groves, provide a beautiful backdrop to the Resort. All in all the Resort can rightfully claim to be one of the most complete of its kind. This is really the ultimate in leisure, where the spacious acres give equal opportunity to those seeking solitude and company alike. Nice well kept hotel, wide and clean rooms and beautiful sand beaches. Food was adequate. No enough places(sun-beds) around pools. We have chosen 5 stars hotel as we used to. 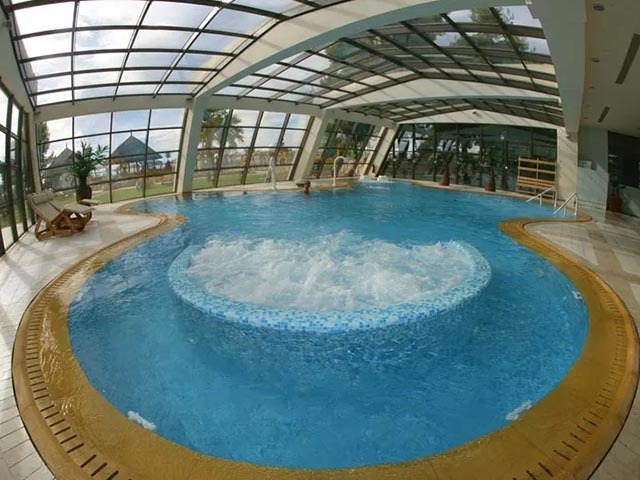 We like clean and nice rooms likewise we do enjoy indoor and outdoor swimming pool and wellness as well. Moreover we like beautiful gardens and delicious food. On your site we saw by the photos and descriptions this hotel would have fit our needs. BUT: In this hotel only the food was appetizing. The public places were untidy. 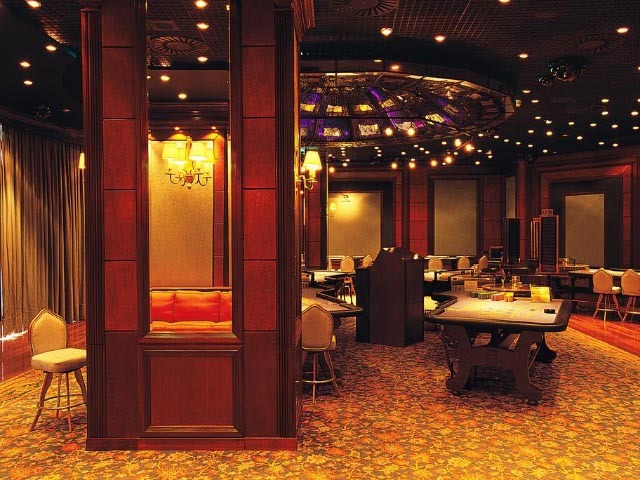 For example, the carpet of the hotel's hall and corridors, the chairs of the indoor restaurant, the chairs and the tables of the outdoor bars, and so on. Everywhere in the garden were lying about garbage plastic glasses, plates, cigarettes. In the pool we saw the same litters, besides different pollutions like algae, colloids. The beds at the seaside were cracked and very dirty, additionally the beach towels were incredibly used and unclean. The public toilets of the seaside were unsavoury. At the pergola bar were shaggy chairs and tables full of leftover food, plastic dishes. It was disgusting to eat there. The hotel room's furniture was worn out, the wall was stained and it was mouldiness in the bathroom. 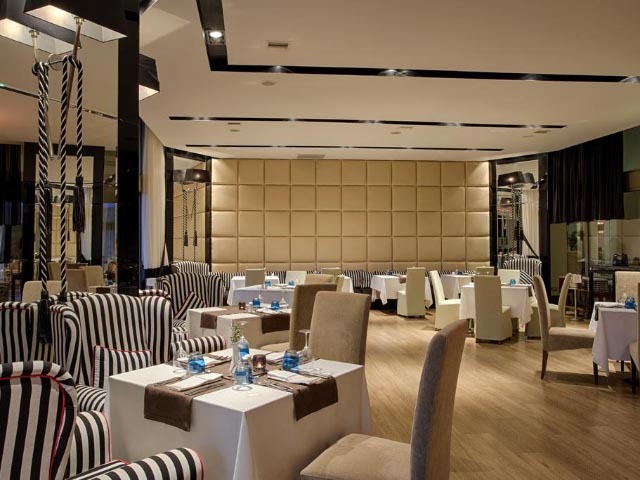 We were pleased with food of the Mediterranean Restaurant, although the textile chairs were food spotted and wet, too. Because of these circumstances we had to use the swimming area and seaside beds of the nearby Meliton Hotel, every time. As you know, we paid for all inclusive service. Despite this fact we had to walk 3 times x 600 m/day for the free food back and forth, additionally we had to pay at Meliton's bar for the bottles of water and Frappes, because we didn't want to walk the all day (we are in the sixties). The following were our choices: we either pay for the drinks or we walk, we either spend our time in a dirty place (Sithonia territory) or we walk. Special Offer up to 30% Reduction - Kid Free !!! Book now and Save yp to 30% Reduction !! Children stay FREE of Charge !! The offer is valid for a LIMITED TIME !! Super Offer up to 45% OFF !! LIMITED TIME !! 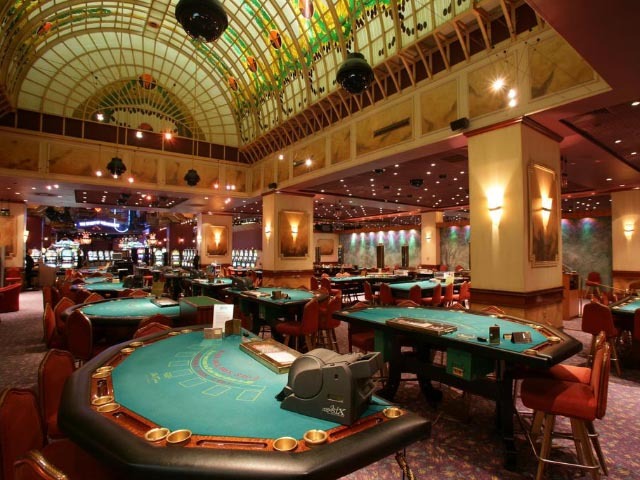 Book NOW and Save up to 45% !! LIMITED NUMBER OF ROOMS !! 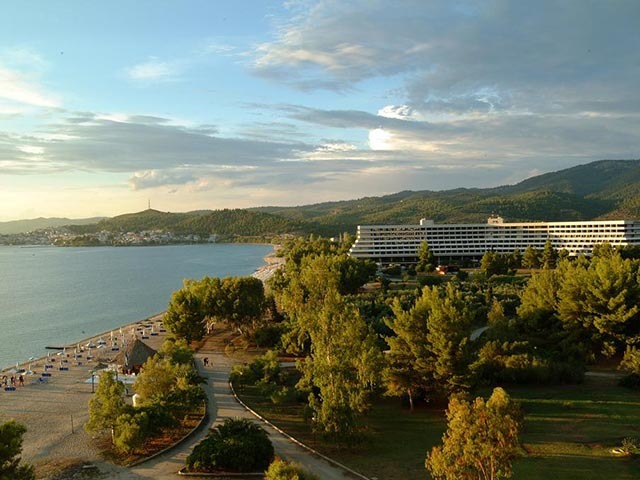 The offer is Valid ONLY for Rooms market (m) Is Not Valid for Greek and Serbian Market ! !